The ferry across Ontario’s Georgian Bay, from the tip of the Bruce Peninsula to Manitoulin Island, in a high wind with enormous swells. The mackerel pattern of clouds dominating the deep blue of a big prairie sky. Dozens of similar images and experiences will be memories of our drive across Canada. We undertook the drive to experience Canada—the distance, scenery, and people—one kilometre at a time, and we were not disappointed. The delicious home-baked fruit pie in Northern Ontario, which can also be found in a hamlet in Saskatchewan, and in a small town nestled in the mountains. These temples to fresh whole fresh food are identifiable by the herd of pick-up trucks surrounding them. On Canadian Thanksgiving we were on Alberta Route 3 heading west from Medicine Hat, when an eastbound sugar beet truck left us an unwelcome memento. 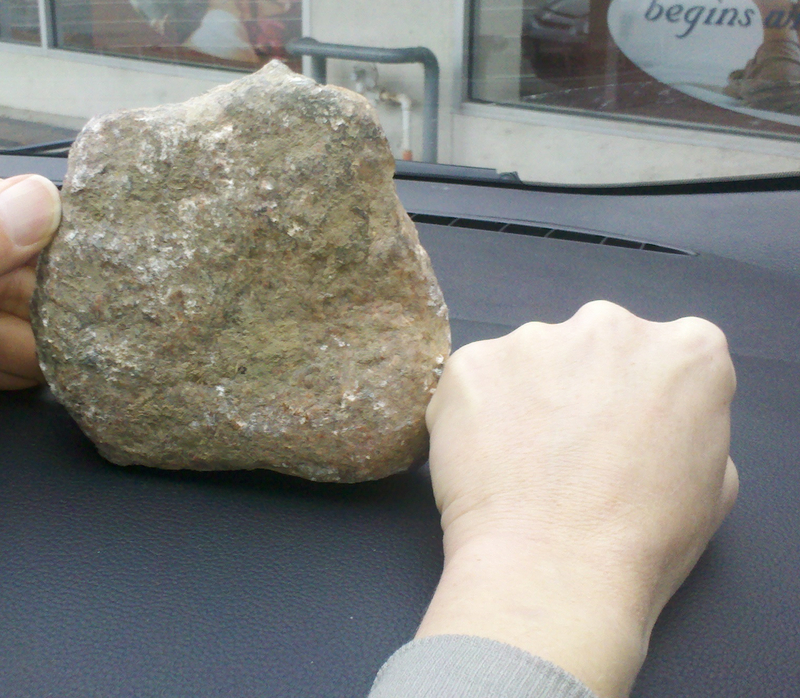 In a micro-second we saw a large rock headed for the windshield. To our relief, it dropped just enough to smash through the grill. Our car was going at quite high speed sandwiched between two other vehicles, and there was no shoulder to pull over. In any event the Honda Fit absorbed the rock without a shudder or any apparent discomfort. I wondered if it was not a rock but a clump of earth which had broken up on contact. As a result we continued on, passed the car ahead of us and proceeded with no apparent ill effect until a red light indicated an overheated engine. So we pulled over and in the middle of many hectares of farmland with no cell phone signal and on a statutory holiday, we were stranded. If I wanted to be negative I could tell you about subsequent dealings with the insurance company. Instead we were lucky to be only about four kilometers from the town of Bow Island and a succession of wonderful good Samaritans: John a farmer (immigrant from Holland) who towed us and refused any payment, Michael the lodge keeper (immigrant from Korea) who advised which unit was unlocked in his closed lodge. Early the next morning the help and advice continued. Lynn of Bow Island Auto Service was highly recommended and, based only on a conversation and a handshake, we left our car with him. Upon inspection, he discovered that the rock had taken out the A/C condenser and lodged deep into the radiator, causing collateral damage behind. By early afternoon we were on our way in a rented vehicle, with the offending rock for a souvenir. There are some who would turn that 24 hour period into a very long chapter! Visiting a sister, our daughter, mother, and a brother slowed down our pace and we are now in Victoria for a few days to arrange closing and other details of our new house before the expected arrival of our furniture on Friday. The unpacking and organizing of the new stamp business awaits us.